$1.50 and a deleted tweet says everything you need to know. This is a real tweet, posted and then quickly deleted by Paul Ryan after an enormous backlash from the internet. 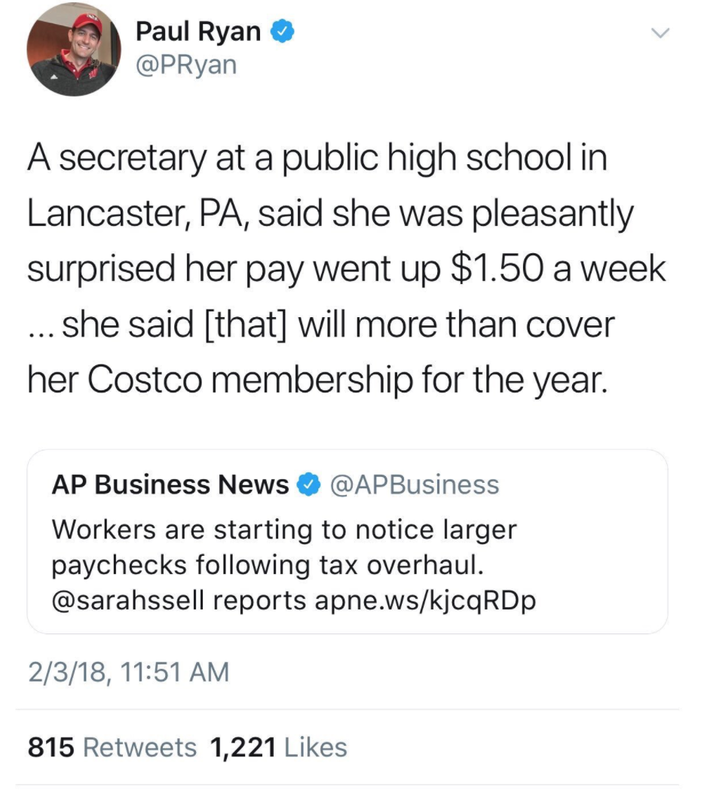 An extra $1.50 per paycheck is a meaningful increase. Something worth bragging about. More than 80% of the tax cut benefits went to the top 1% (which is why this secretary is only seeing an increase of $1.50 per paycheck). Trump will save an estimated $15 million dollars thanks to the tax cut, and his son-in-law, Jared Kushner, will save an estimated $12 million dollars. The U.S. government is set to borrow nearly $1 trillion this year, an 84 percent jump from last year, thanks to the tax cut. The rising national debt has already triggered a rise in interest rates, which were partly responsible for the Dow's 666 point selloff on Friday. Ryan received a $500.000 donation from the Koch family immediately after the tax bill was signed. This is truly the fleecing of America. Enormous sums of money are now running directly into the coffers of the wealthiest Americans, while high school secretaries are left with $1.50 extra per week. It's not wrong. It's not irresponsible. It's just plain evil.